When I started competing I thought I had to eat every few hours. This was something that I had read about, but more importantly (at the time) it was something that I saw over and over again in practice online. For me, every few hours meant every three hours. I was on a cycle of eating about seven or eight meals or snacks, which were small in volume. I didn’t have macronutrient goals per meal (I still don’t). I didn’t have calorie goals per meal (I still don’t). Now, there’s nothing wrong with eating in this structure. I do think small meals can help you get through the day, but naturally, this method also has you in a cycle of wondering what time it is and when the next meal is coming. This kind of focus on meal timing has the potential to be harmful mentally. This concept can be considered grazing, since meals are consumed steadily throughout the day instead of in two or three large meals. Transitioning away from this approach to eating when I was hungry was a slight struggle at first. However, after a few months, I relearned my body and now I have an idea of meal timing that works for me as well as how full certain combinations of foods make me so that I can plan when I’m on the go. One positive thing from this eating structure is that I started to eliminate labels from food like breakfast, lunch and dinner. By removing labels and eating what I’m interested in, I gave myself more flexibility and diversity to my meals. Some days I just want eggs for dinner – they’re also quick and no hassle. I hear often, that snacking is bad, can lead to weight gain and in some cases can lead to going “off-track”. I think many confuse having a snack with negative snacking behavior like what we describe as mindless eating. I do also understand that some foods can lead an individual to not stay on track and in that case, I would encourage that person to dig deeper and think about why that food has that power. So snacking, what’s the science say? Other research has defined a snack by caloric consumption, social interactions and the time of day for the consumption, but “these definitions fail to consider the influence of social patterns and/or cultural norms on timing and size of eating occasions (Chaplin & Smith, 2011).” These definitions also don’t take into consideration a person’s motivations to eat such as not triggered by hunger or social environment. Another article that reviewed definitions of snacking and motivations to snack found that without a consistent definition of the words snack and snack, it’s hard to determine if prevalence has increased and if it does in fact contribute to weight gain (Hess, Jonnalagadda, & Slavin, 2017). Snack: an individual food or light meal consumed between meals with or without intent. Researchers of the 2011 study also found that language used to describe and talk about food influenced how it was reported such as labeling “healthy foods” as snacks (Larson, Miller, Watts, Story, & Neumark-Sztainer, 2016). Gender also made a difference. While having a snack can simply mean that you have consumed an individual item or light meal with intent, snacking behavior is typically associated with over-consumption of calories. A 2016 study in the Journal of Nutrition examined snacking behavior from 2,793 adolescents to determine the influence this behavior had on weight status (Larson, Miller, Watts, Story, & Neumark-Sztainer, 2016). Researchers were interested in this examination because there is a lot of conflicting findings that suggest snacking behavior may or may not contribute to weight status in young people, which impacts the strategies provided to those seeking to improve dietary adherence. What they found was that snacks have the potential to be calorically-dense, which may cause someone to over consume calories; however, the behavior on its own of having a food or light meal in between meals isn’t inherently harmful to health (Larson, Miller, Watts, Story, & Neumark-Sztainer, 2016). However, paired with other behaviors, there’s greater potential for calorie-dense snacks to be chosen such as watching television (mindless eating) and skipping legitimate meals. As an adult, I look back on times in childhood and think about the things I missed out on – the hours of naps I said ‘no’ to and the snacks I missed out on. As an adult, these things have greatly helped me maintain my health, even when there are times it doesn’t seem so great. Being “allowed” to have a snack truly comes down to the psychology of dieting and eating behaviors. It comes from having all or nothing mindset. What we thought we knew about a healthy lifestyle has been made more complicated by the reality that we need to be healthy mentally as well and understanding that creating lifestyle change doesn’t happen in a bubble. Going back to the definition that I created above – the ending, with or without intent. I think this part is key. Having a snack with intention means it’s part of the plan. When I plan out my day, especially if I know I will be in and out of the house, I intentionally pack them with me. There’s potential that I won’t need them, but having a snack planned helps me with dietary adherence or “staying on track”. I know if I’m truly hungry, I can wait about 30 minutes before I feel like I need to find something. If I don’t have a snack with me I’m more likely to not care about my choice, which will more than likely be calorie-dense. As a society, we’ve changed greatly in the past 50 years. The workforce is larger with more women going to work, many of us work jobs with longer hours or nontraditional hours, we’re are living at home longer, having children later, obtaining more education, etc. If our schedules have changed and adapted with the needs of society, why not adapt our eating to our lifestyles? There is no right way to go about meal timing, which means there’s no wrong way either. If we can take away labels and change the language that we use when we describe food, we may be able to create eating behavior that encourages adherence and gives us the satisfaction of participation. When labels are removed the possibilities are endless. Eating well doesn’t have to be expensive and it doesn’t have to be complicated. I carry one or two protein bars in my purse, but I will also put some crackers or pretzels for the when I’m running around. Nuts: pistachios for JP, walnuts for me! A helpful tip, that I still implement is to portion my snacks when I get them home from the store since I typically plan and prep the day I grocery shop. This isn’t necessarily ideal for all foods because some could get stale, but portioning a few snacks can be helpful. If you don’t plan out your week and prefer to take it a day at a time, you can still portion out some snacks so that they’re easier to grab when you’re on the go. If you don’t mind buying individually wrapped snacks, that’s also fine. I don’t buy everything individually wrapped because it’s not cost effective for us., however, if you know that the packaging makes a difference in your decision-making then you need to find a strategy that works for you. Tell me, how are your choices impacted when you don’t have something on hand or something planned? Chaplin, K., & Smith, A. P. (2011). DEFINITIONS AND PERCEPTIONS OF SNACKING. Current Topics in Nutraceutical Research , 53-60. Hess, J. M., Jonnalagadda, S. S., & Slavin, J. L. (2017). What Is a Snack, Why Do We Snack, and How Can We Choose Better Snacks? 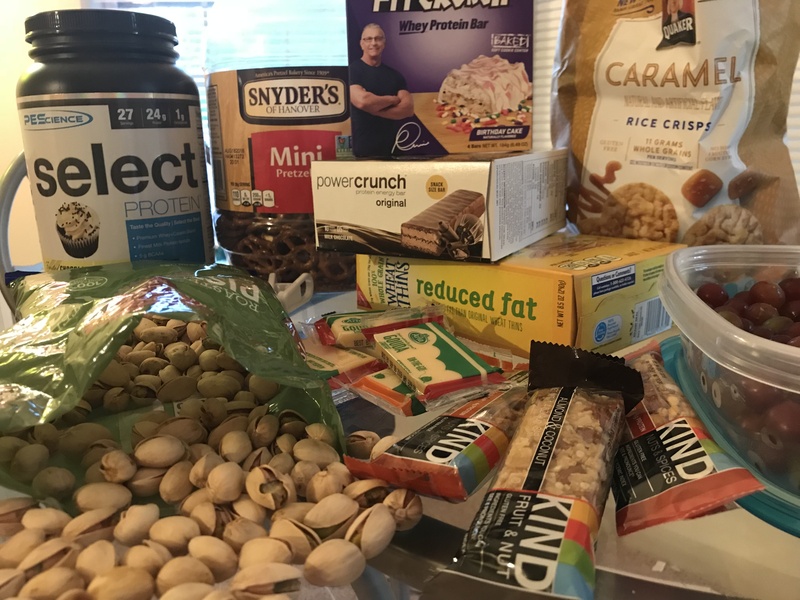 A Review of the Definitions of Snacking, Motivations to Snack, Contributions to Dietary Intake, and Recommendations for Improvement. Advances in Nutrition, 466-475. Larson, N. I., Miller, J. M., Watts, A. W., Story, M. T., & Neumark-Sztainer, D. R. (2016). Adolescent Snacking Behaviors Are Associated with Dietary Intake and Weight Status. The Journal of Nutrition, 1348-1355.